I have had many friends tell me about their experience with food poisoning; and most of their stories sound pretty frightening. I have never had food poisoning and hope to never suffer from this illness. However, during the past week, I have been having some really weird things happen with my tummy and a little nausea. So, I googled some things to both identify a few home remedies and learn some important facts to help me ease my discomfort. I came across several websites and fact sheets that were very interesting. I realized that my symptoms weren’t in line with what experts have indicated as food poisoning symptoms but the information that I came across, about Botulism, peeked my curiosity. What is Clostridium Botulinum? According to the USDA this bacteria is “anaerobic, meaning they live and grow in low oxygen conditions. The bacteria form protective spores when conditions for survival are poor. The spore has a hard protective coating… [and is] able to survive for years” (para. 2). Did you know that botulism is life threatening? The USDA has indicated that even the smallest amount of this bacterium can cause illness or death. What’s more interesting is that botulism illness has been linked to aluminum foil covered “baked potatoes [and] honey (the primary cause of botulism in infants)” (para.3). Wow, I didn’t know that! The CDC has reported that there are five main kinds of botulism and they include foodborne botulism, infant botulism, wound botulism (I never ever heard of this one) adult intestinal Toxemia botulism and iatrogenic botulism (…or this one).” In the United States, an average of 145 cases of botulism are reported each year and approximately 15% of these cases are foodborne, while 65% are infant botulism and the remaining 20% are wound botulism cases” (CDC). Baby Formula: When it comes to fighting infection, infants and toddlers have insufficient immune systems. So, food-handling precautions are especially important for the very young. Bacteria can quickly grow in formula that is left out at room temperatures, so bottle-fed babies are at a higher risk for foodborne illnesses. Leafy vegetables:Nearly half of foodborne illnesses stem from produce, especially leafy greens, according to the CDC. Experts suggest buying from a reputable source, keeping produce refrigerated and rinsing it in cold water before eating. If you buy pre-washed spinach, don’t wash it again at home, where new contaminants might be introduced. Home Canning: In the early 1900s, insufficiently cooked canned foods led to big botulism outbreaks. Government regulators cracked down on the canning industry and the botulism problem was mostly eliminated. However, home canning still results in occasional cases of botulism. Baked Potatoes: Clostridium botulinum grows in soil and other places where there’s no oxygen, forming heat-resistant spores. Potatoes, which grow underground, can come into contact with these spores. So be careful when baking potatoes. To avoid spore growth, don’t leave foil-wrapped baked potatoes sitting out at room temperature. Eat the potatoes within two hours of cooking. If you need to save them for later, keep them at 140 degrees or hotter, or refrigerate the baked potatoes within two hours of cooking (CDC, MSN). Classic symptoms of botulism appear 18 hours to 10 days after eating the bad food. They include double vision, blurred vision, slurred speech, drooping eyelids, difficulty swallowing, dry mouth and weak muscles. Untreated, victims may be paralyzed or die. If caught early enough, doctors can treat botulism with an anti-toxin made from horses (CDC, MSN). So, does your tummy hurt? If it does hurt it may not be caused by botulism but you may want to check out the websites below and find out more about botulism. 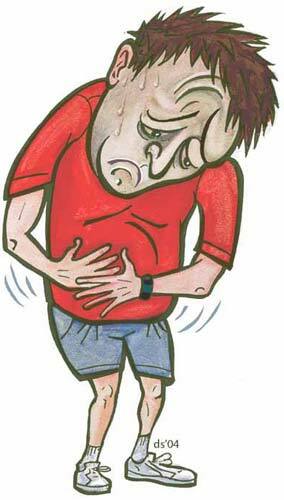 If the discomfort in your tummy persists, you should always consult your doctor. This entry was posted on Thursday, March 13th, 2014 at 2:13 pm and is filed under Cooperative Extension Program, Family and Consumer Sciences. You can follow any responses to this entry through the RSS 2.0 feed. You can leave a response, or trackback from your own site.